If you plan to visit some tourist place and your plan is to travel by road; Here we leave some recommendations so that you get safely to your destination and enjoy your trip to the fullest. When you go to travel on the road, you have to be 100% sure that your car is in perfect condition. Remember to check water levels, oil and liquids. A few days before your trip, take the car with a mechanical service to check hoses, brakes, suspension, etc. This will help to detect any mechanical failure to have a perfect car to travel. Make sure your tires are in good condition, when the tires are properly inflated helps reduce fuel and last longer. Do not forget the spare tire and equipment to change. Carrying the luggage necessary if the car luggage overload you could increase the risk of rolling over in a curve. Like good advice, try to accommodate luggage in the trunk and not on the awning of the car. Times and know how to get are important parts of your trip. Design a route and calculates the toll costs and diesel. When planning a route to avoid wasting time. Estimated travel time, including stops for breaks. Bring you a map will be useful for some unexpected. Cash charge for stands and diesel. Not always accept credit cards, it is better to be prepared with some cash, in the same way there are economic destinations that do not require much money. Technology is on our side. A GPS device is a great tool that lets us know where you come from, where you are and what route to take to get to your destination. When you are driving it is important not to take a hurry, driving calmly and respect break times. Remember that safety is first and then the fun for children, friends or just by yourself. All passengers must wear seat belts, either in the back seat or child seat. Remember that children must travel back. The driver must sleep at least eight hours before the trip, and rest at least every 4 hours to stretch the muscles. If you travel just do not risk driving tired, better stop at a hotel or take into account that you had to rest before. The driver should not eat heavy meals before and during the trip. It is best to stay well hydrated. Plan your trip in advance, thus manage to avoid disruptions in travel and creates stress on your holiday. Do not forget the personal and car insurance documents. If you suffer a mishap you will be of great help. The same that bring extra money for unforeseen events that may occur. Distracted by the phone, smoking, driving under the influence of alcohol and driving at high speed. This will help you better enjoy your trip and your holiday with family, friends or just by yourself. 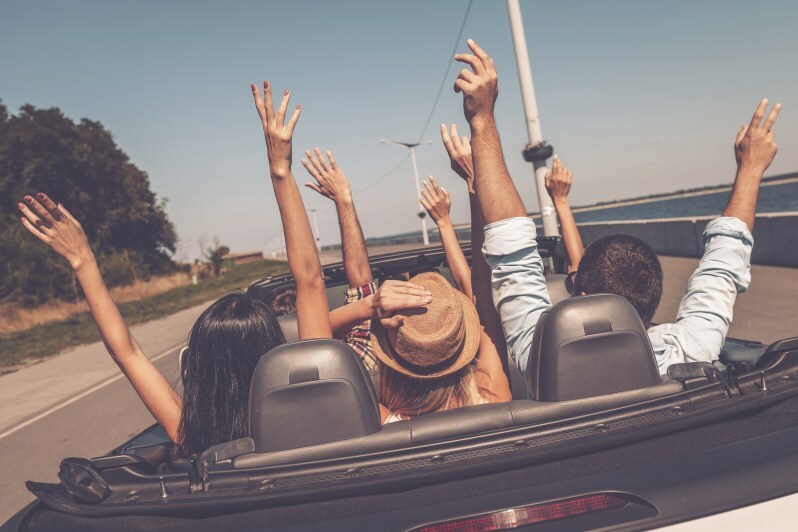 Make a road trip with friends or family can be an excellent idea to relax, forget their problems for a while and create good memories along the way.